Widely distributed throughout the U.K. including the Isles of Wight, Scilly, Anglesey, Man, the Western Isles (although many of these are older records) and Orkney although the impression gained from the latest NBN map (May, 2009) is that the species was formerly much more widespread. We have not recorded them from our Watford area but there are records from southeast Herts. and southeast Bucks and so it is probably reasonable to expect it. Generally a species of sandy or peaty soils; on open grassland, heath or moorland but also in open forest rides and coastal sand dunes. Adults occur between early March and July and are unmistakable both in appearance and habits; they are active in bright and hot sunshine when they run swiftly or fly short distances in pursuit of prey, generally other insects. The vivid green upper surface and strongly metallic underside are both eye-catching and fascinating; no other British species can be confused with them. The larvae are subterranean, living in vertical burrows up to 30cm. deep which they excavate themselves. They lack terminal cerci but the dorsal surface is angled upward and they possess hooks on the fifth tergite which support them when climbing the burrow, the head is flattened and expanded dorsally into a semicircular plate which is fringed and covered with sensory setae and this forms a cap to the entrance of the burrow, when passing prey are sensed the larva strikes out rapidly to seize it. The circular burrow openings may be noticed by the debris scattered by the larva. Development takes two years. 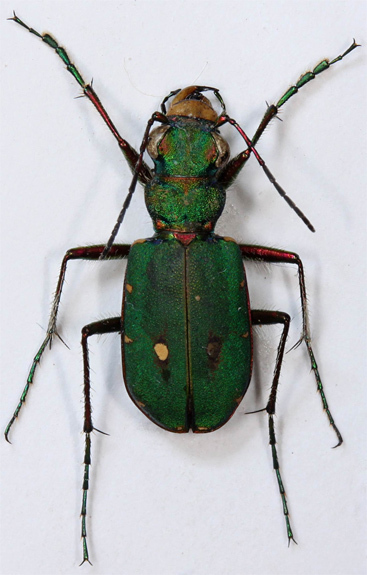 The following description is intended only to outline interesting features of the beetle, for purposes of identification the accompanying pictures are all that is needed. 12-17mm. Upper surface varies from brilliant deep green, which is normal, to dark green, and there is an almost black form, funebris Sturm, which occurs very rarely in the Clyde district of Scotland (Fowler). There are usually five distinct white to pale yellow marks around each elytral edge; the anterior one at the humeral angle and the posterior one at the apex, the apical two may be joined. There is usually a small dark mark near the suture and towards the base; according to Fowler this is obsolete in the male. The front and hind pronotal margins and the lateral elytral margins are generally brilliant coppery-red. The elytra lack striae but are finely punctured and granulate. Head proportionally very large with side margins almost entirely occupied by large, bulbous eyes. 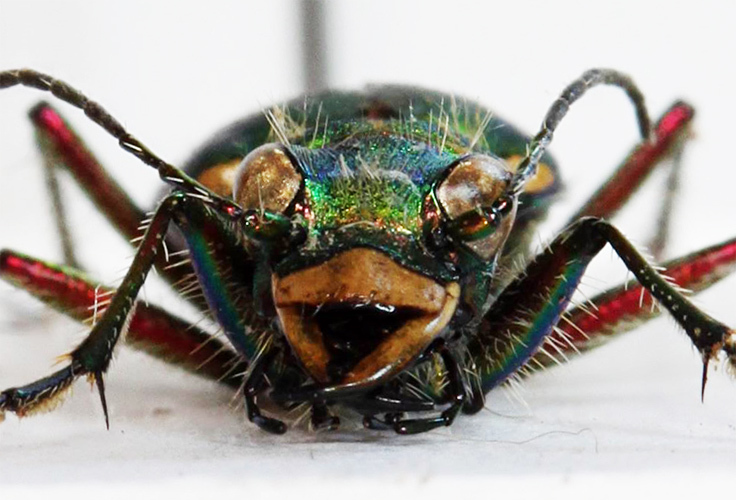 Antennae dark with basal segments bright metallic green, coppery or bronze, inserted on upper surface in front of eyes and inside outer margin of mandibles. Mandibles large, scythe shaped and strongly toothed on inner edge. Labrum smooth (i.e. without a central ridge) and pale at least in part. Clypeus narrow and very wide; wider than distance between antennal insertions. Pronotum transverse; as wide as head. Legs long and slender, metallic and pubescent. Male with a median incision to the sixth abdominal sternite and with basal pro-tarsal segments dilated. Under surface brilliant metallic; red or coppery to thorax and usually green to abdomen.